Acid free, 5mm x 5mm x 1mm thick, foam padswith adhesive on both sides. 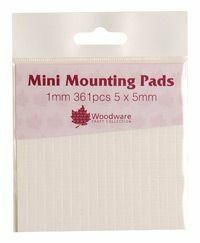 These mini foam mounting pads are perfect for sticking embellishments etc to cards and scrapbook pages, the 1mm height will give a slight lift from the surface they are adhered to adding extra dimension to your projects. 361 pieces per pack.